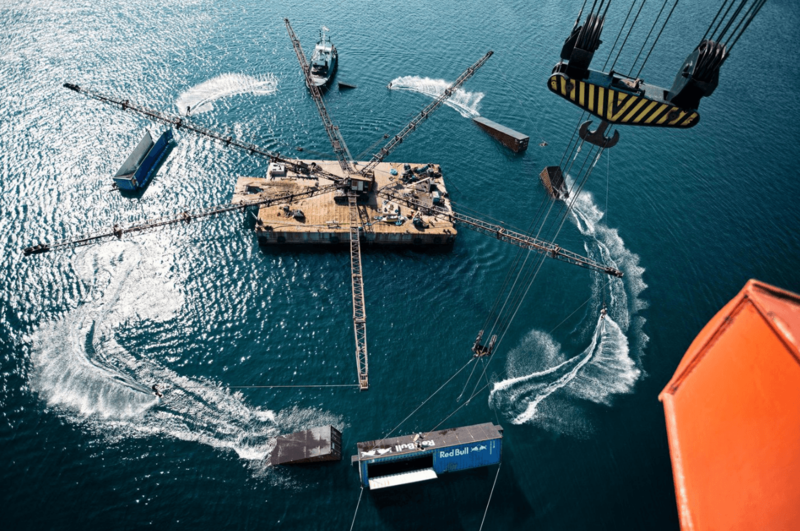 If you get your kicks from wakeboarding but you can’t find a friend to steer the motorboat, how about grabbing some old shipping containers and a crane and setting up a rig like this instead? Pro wakeboarders Dominik Hernler, Felix Georgii, and Dominik Gührs recently did just that, though admittedly they had a little help from Red Bull along the way. The trio hit a port in Croatia for their borderline bonkers wakeboarding project. As the video shows, the central component was a crane with a 40-meter boom. When it swung around with a rope attached, the water-based daredevils could hit speeds of up to 37 mph (60 kmh). The actual circuit comprised seven shipping containers in all. Each one was anchored in different ways to provide Hernler, Georgii, and Gührs with a supremely unique challenge that thankfully didn’t lead to any of them inadvertently suffering supremely unique injuries. Besides the usual kinds of water jumps, the 360-degree course also included a boat whose railing was converted into a slide rail, and a kicker built inside one of the containers. “It was a scary obstacle at first, but we soon started loving it because there’s never been a similar obstacle in wakeboarding,” the 26-year-old German told Red Bull. The slickly shot video makes the action look like a whole lot of fun, though some pretty focused minds were clearly needed to ensure the smooth execution of each of the carefully planned stunts. But if all that kit is slightly beyond the realms of possibility and you don’t have a cable skiing experience nearby for a solo outing, you could always give this drone a go instead. Good luck! Cuphead is notorious for being an exceedingly tough boss rush game. Now that the gorgeous action game has arrived on Nintendo Switch, we decided to rank all 19 of its bosses from easiest to hardest.